Baby wipes are an excellent product for parents; they can quickly freshen the area after changing, and they also can be used to wipe your baby's face when they are a little messy with their food. The primary drawback of these products is that baby wipes are typically not self-warming. This means that when it comes time to change the little one, you'll have to expose their little tushies to a baby wipe that'll feel cold. Fortunately, this is where wipe warmers come in. Prince Lionheart wipes are some of the most valued in the industry because of their use of rayon and bamboo. This mix makes for very soft and absorbent wipes that are very useful at change times. If you don't want to use the Prince Lionheart wipes, this is a very versatile wipe warmer that can also warm other types of wipes, including those that are made of paper. If you're looking to lead a lifestyle that is earth-friendly, using the Prince Lionheart wipes with this device can help reduce the usage of paper. Bamboo-derived baby wipes are very eco-friendly. The Prince Lionheart warmer is antimicrobial by way of a unique pillow at the base. The pillow uses micropore technology to fight microbial growth and absorb moisture so that it is recirculated. You'll have to be careful of extra moisture; this isn't a completely moisture-proof device. It doesn't have a light. The Munchkin Warm Glow warmer heats the wipes from the top of the product, so once again, you can expect nice and toasty wipes when you pull them from the top of this unit. Of course, it's important to not leave the heating element on for extended periods as this will dry the wipes out quickly. This warmer also features a 10-minute auto shutoff feature so that you and your baby won't be disturbed by the light. This has an excellent capacity as well; the Munchkin warmer can store 100 standard-sized baby wipes. This is an inexpensive product. It has a green-tinted window section so that you can keep an eye on wipe level and status. The machine unplugs from the body of the warmer; this is fairly uncommon among wipe warmers. The light is somewhat dim. The product is somewhat large. The lighting feature of the Hiccapop Wipe Warmer is very bright, which means that you'll be able to see your little one easier in the dead of night. The heating element on the Hiccapop unit is at the top of the warmer, which is useful because it means that you'll always have access to the warmest wipes. This is also a very versatile product; Hiccapop designed it to be able to use just about any wipe. Users can also visually check the amount of wipes left in this warmer. This is done via a wipe window that runs through the front of the product; this is also a great way to check the wipes for safety. The light on this Hiccapop product will shut off after 10 minutes. The window is very useful for keeping an eye on the wipes. Hiccapop uses silicone in the seal, which prevents wipe browning. The cord can't be unplugged from the warmer. For those parents that tend to hold their baby before changing them, this wipe warmer's lid doesn't employ a latch. This makes it much easier to grab the needed wipes from the top without having to have two hands. Additionally, since this warms from the top, you don't have to worry about the topmost wipes being only mildly warm. 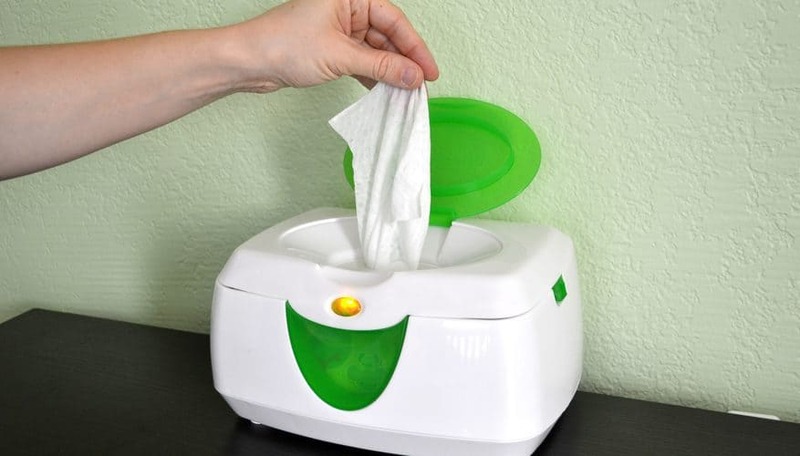 Like the Hiccapop unit, this baby wipe warmer has a window, which is very useful for eyeballing the status of your wipes. You can tell how many are left, if anything is growing on them, or if they are looking dry. This is a great warmer for keeping wipes at a consistent temperature. It heats from the top so that you'll always have warmer wipes for your baby. Sometimes, you may need to add a bit of water to remoisten the wipes. The Lil' Jumbl warmer has a feature that isn't often found in many of these types of devices: it has two actual heat settings. This means that you can use the higher setting to get the wipes to a preferred temperature at a faster rate or you can keep the lower setting on for gradual warming. This product also has a light for night changing. Like the Hiccapop product, this warmer's light turns off after a period of 10 minutes has elapsed. This is also a top-down moistening unit, which prevents the wipes from turning brown or drying out. This has a good-sized window so that you can eyeball the amount of wipes remaining. It can hold 80 wipes at a time. The top section is also transparent. The warmer has a wide base, which lends stability. Its wider base makes it a bit bulky for parents with less space. These products, at first, look like standard baby wipes. They are small, rectangular boxes that look very unassuming and plug into the wall. These warmers utilize moisture and a heating element to keep the wipes at a nice and toasty temperature so that the sudden cold doesn't irritate your baby. Typically, most baby wipe warmers utilize a sponge at the top of the wipes to keep the wipes moist and the heat comes from below. As the heat circulates in the interior of the warmer unit, the moisture also circulates keeping the wipes moist and warm. Some models employ a spray, but these typically will cost you a bit more cash. As you might expect, a dedicated wipe warmer has to be kept sealed because excess air will dry out the wipes fairly quickly. While slight drying is natural, as long as you keep your warmer closed, your wipes should stay nice and damp indefinitely. It's important to visually appraise these warmers because it is possible for mold to form on them, so always take a look before you use a wipe. Can mold be a problem with wipe warmers? Well, most environments that are warm and moist are actually the perfect places for mold to and other microbes to form. The last thing you want is to expose your little one to these potential pathogens, which is why there are models on the market that actually employ antimicrobial features to prevent this type of growth. Typically, this functionality is "baked" into the plastic of the warmer itself, but there are models out there that place the antimicrobial materials into the warming pad. These features are fairly useful, and they make it that you won't have to eyeball the machine before each use. This is a very useful feature, especially for newborns that haven't quite gotten their days and nights down yet. Unfortunately, as a new parent, you're going to have some very odd hours; you'll be getting up to change your baby in the wee hours, and if you want to go back to sleep or refrain from disturbing your partner, you may not want to turn on a bright light. With this in mind, some warmers have a lighting function. The type of system varies, but these provide a little bit of light so that you won't have to turn on a brighter one. The types vary; some warmers have lighting features that turn on when you flip a switch and some stay on permanently. These can be a bit annoying if you're sharing a room with your baby. If you have this type, it's important not to try and cover up the light since they can get very hot and pose a fire hazard. A wipe warmer is an invaluable product that can help make the sometimes jarring situation of late night changes much more convenient and comfortable for your baby. Each of the products that we've reviewed in this guide will provide some excellent functionality and each has a great system to warm and maintain the heat of your wipes. If we had to select a winner from the list, we'd go with the Prince ﻿﻿Lionheart product. This product has a lot of built-in versatility and will let you switch to cloth-based wipes if you'd like to not use paper ones. Additionally, the Prince Lionheart wipes are very comfortable for your baby due to their softness, which is very useful when you want a nice and easygoing changing.